The course is bookable up to 15 days before each date. The ACLS course of the American Heart Association teaches a cardiocirculatory arrest advanced handling. Particular attention will be given to team working aspects and an effective communication, which are essential elements for succesful resuscitation manoeuvres. The course will exploit audiovisual resources which are certified by AHA and will be commented by the instructor who will offer many details on the different contents. There will be one instructor every six students (as established by the AHA guidelines) to guarantee the right monitoring and correct students during all the practical sessions. N.B. : The course is bookable up to 15 days before each date. All the participants are required to study the manual which will be delivered 15 days before the start of the course. The manual will include all the topics related to the course. This will facilitate theory understanding and will leave space for practical training. In addition to the manual, the participants will be provided with two reminders containing all the algorithms which will be discussed in class. The manual is also available in eBook format. To acquire theoretical knowledge and practical skills necessary to both diagnostic and therapeutic process relating to cardiac arrest. To acquire the capacity of coordination of an advanced resuscitation team. 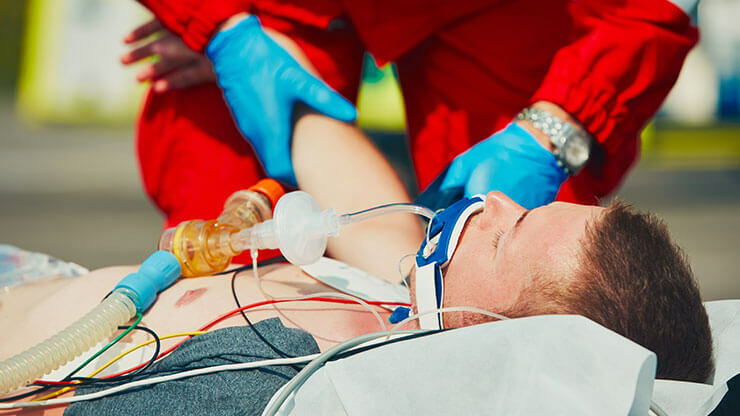 Through practical instructions and simulations, all the participants will improve their skills in recognition and intervention in case of cardiopulmonary arrest, in Post-cardiac arrest conditions, acute arrhythmia, stroke and acute coronary syndromes. In its first phase, the ACLS course will focus the attention on the review of the basic cardiopulmonary resuscitation elements (chest compressions, mechanical ventilation, AED use). The course will continue with the diagnosis and treatment of cardiac and respiratory arrest and peri-arrest, advanced airway management, diagnosis and treatment of coronary syndromes and stroke and the pharmacological aspects associated with all these pathologies.